The Honey Tangerine is a bright little ball of concentrated tangerine sweetness! It may be the sweetest citrus we grow. It also makes gorgeous, deep-orange juice - almost the color of a pumpkin. You can&apos;t buy juice like this in stores. This is a tangerine, so it&apos;s a bit smaller and squatter. Some years Honeys may be more golden, others more red-orange. The peel color varies with the weather. You may sometimes see a bit of green on the skin as well, due to climatic conditions. The Honey Tangerine is well-loved for its explosively sweet, “honeyed” taste. 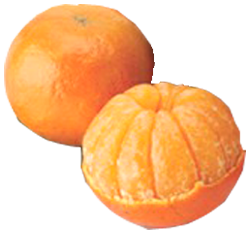 The Honey Tangerine is a nice, juicy fruit with soft, succulent sections. Like other tangerines, the Honey Tangerine does come with some seeds (around 10 to 20). The Honey Tangerine has a thin, easy-peel rind and it sections up beautifully. Many enjoy eating this fruit out of hand for its great flavor. It&apos;s especially popular with kids due to its sweet taste. If you have a sweet tooth on your list, ship them a gift basket of Honey Tangerines - they&apos;re nature&apos;s candy! In Florida the Honey Tangerine is available March to April. As our latest-maturing tangerine, it is available into the spring for those who need a little citrus “pick-me-up” during those wet, blustery March days. Although it&apos;s typically referred to and thought of as a tangerine, this fruit is actually a cross between a tangerine and an orange. The Honey Tangerine is also referred to as a “Murcott orange” or “Honey Murcott” after a Florida citrus grower named Charles Murcott Smith. Smith was one of the earliest growers of the Honey Tangerine, and a tree from his acreage is still alive today in Bayview, FL. The tree is almost 100 years old. Though much of the history of the Honey Tangerine is lost to the mists of time, it&apos;s thought that this variety originated with the USDA around 1916. It was then popularized by Charles Murcott Smith, who owned a nursery in Pinellas County, FL, in the 1920s. Smith gave the Honey Tangerine its other common name (Murcott orange).